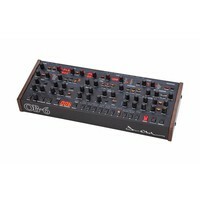 6-Voice Polyphonic Analog Desktop Synthesizer. 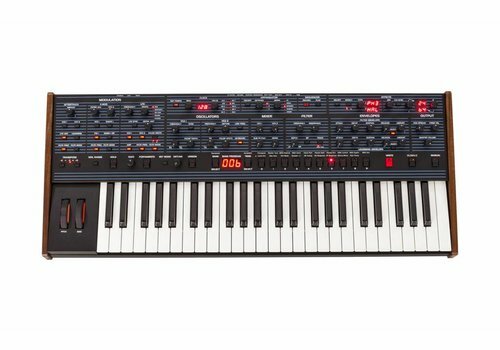 Classic Oberheim Sound — Made Portable! The OB-6® desktop module is just as powerful and easy to use as its counterpart, the OB-6 Keyboard. 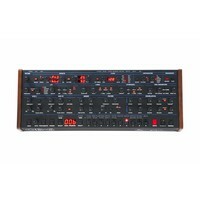 The module has all of the same controls as the keyboard version and provides the same immediacy and ease of use. 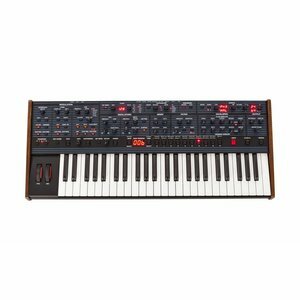 As with the OB-6 Keyboard, all parameters are at your fingertips, with full-sized knobs and switches and a comfortable, intuitive layout. How does it sound? Massive — just like the keyboard, because on the inside, it’s exactly the same. The same analog signal path with discrete VCOs and VCFs. The same high-quality digital effects. The same classic Oberheim sound that has been earning raves from musicians around the world. We’ve also added a poly chain feature so that any two OB-6s can be paired for twelve-voice polyphony! Two Legends. 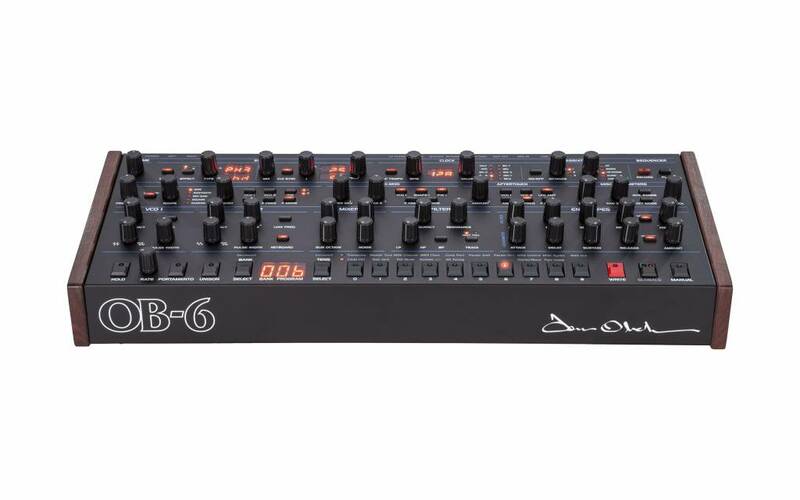 One Instrument — Both the OB-6 desktop module and OB-6 keyboard are a once-in-a-lifetime collaboration between the two most influential designers in poly synth history, Dave Smith and Tom Oberheim. 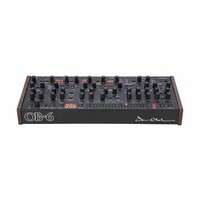 The OB-6 takes the classic bold Tom Oberheim sound — with its true voltage-controlled oscillators, 2-pole filter, and amplifiers — and adds modern enhancements such as studio-quality effects, a polyphonic step sequencer, an arpeggiator, and more. 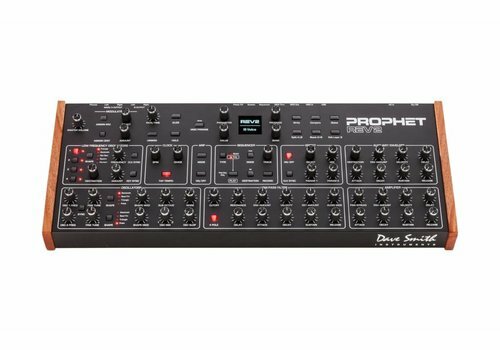 No other modern analog poly synth can boast such a pedigree or such a massive, in-your-face sonic signature. Vintage SEM Tone — The OB-6 sound engine is inspired by Tom’s original SEM, the core of his acclaimed 4-voice and 8- voice synthesizers. It features two discrete voltage-controlled oscillators (plus sub-oscillator) per voice with continuously variable waveshapes (sawtooth and variable-width pulse, plus a triangle wave on oscillator 2). 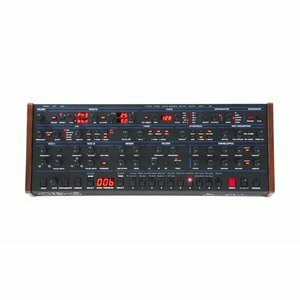 The classic Oberheim-inspired 2-pole, state-variable, resonant filter provides low-pass, high-pass, band-pass, and notch functionality. Voltage-controlled amplifiers complete the all-analog signal path. Dual Effects — The dual effects section provides studio-quality reverbs, delays (standard and BBD), chorus, flangers, and faithful recreations of Tom’s original phase shifter and ring modulator. While the effects themselves are digital, with 24-bit, 48 kHz resolution, a true bypass maintains a full analog signal path. 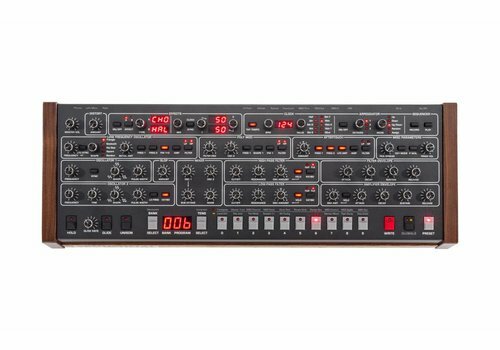 X-Mod and Poly Step Sequencing — Also present is X-Mod, which expands the tonal palette and makes it easy to create dramatic and unconventional sounds. Modulation sources are filter envelope and oscillator 2, both with bi-polar control. Destinations include oscillator 1 frequency, oscillator 1 shape, oscillator 1 pulse width, filter cutoff, and filter mode. 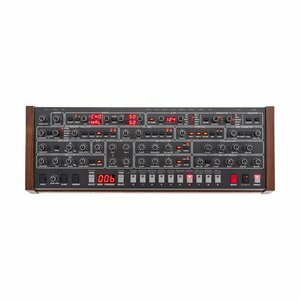 The polyphonic step sequencer allows up to 64 steps and up to 6 notes per step. You can create sequences polyphonically, with rests, and sync to an external MIDI clock. 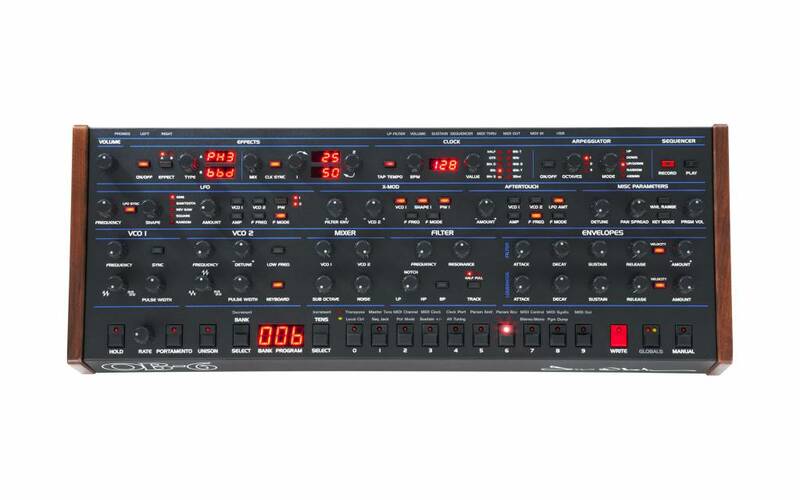 The full-featured arpeggiator can be synced to external MIDI clock as well. Unison mode features configurable voice count (1-6 voices), chord memory, and key modes. 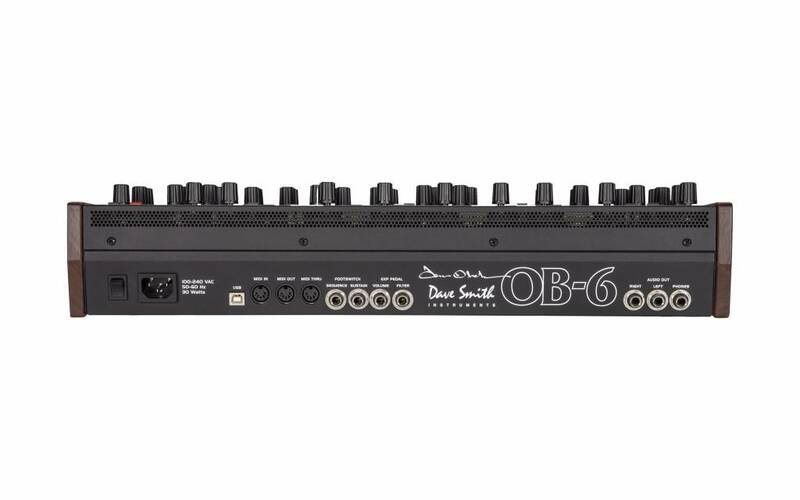 Easy to Program — The knob-per-function front panel puts virtually all OB-6 functions at your fingertips. Included are 500 permanent factory programs and 500 rewritable user programs. 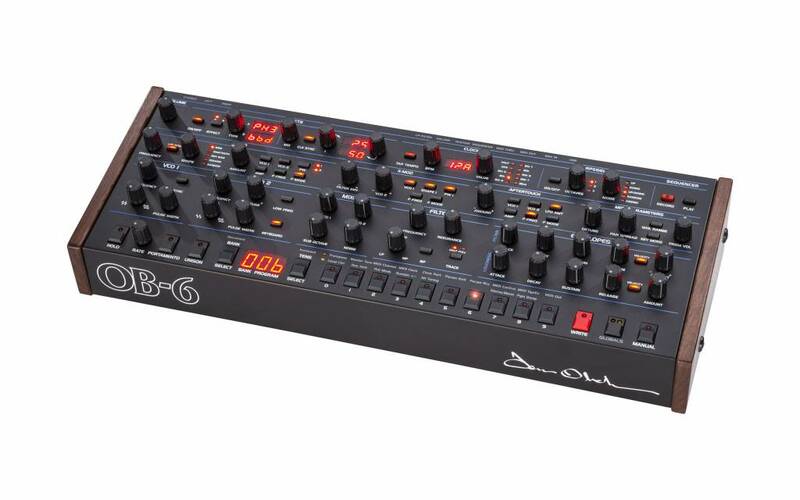 Turning on the Manual button enables live panel mode, in which the sound of the OB-6 switches to its current front panel settings. In this state, what you see is what you hear. 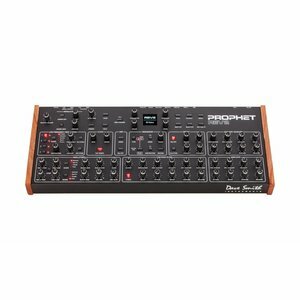 Easy to Play — This analog powerhouse is packed into a desktop module that’s small enough to fit in a backpack. It’s an ideal combination of portability and power for the project studio or the gigging musician.